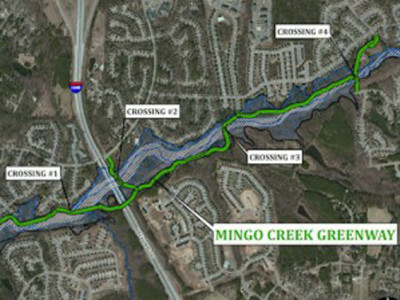 Ecological Engineering provided subconsultant services to Stewart for implementation of the Mingo Creek Greenway Project. Our services included hydrologic and hydraulic analyses, and modeling, natural resources investigations, and environmental compliance and permitting. Wetland mitigation was required as a result of unavoidable impacts to jurisdictional resources. A CLOMR was prepared based on a rise in base flood elevations. This required extensive coordination with NC Floodplain Mapping Program, the Town of Knightdale and our Client. Environmental permits and the CLOMR were issued in 2012.